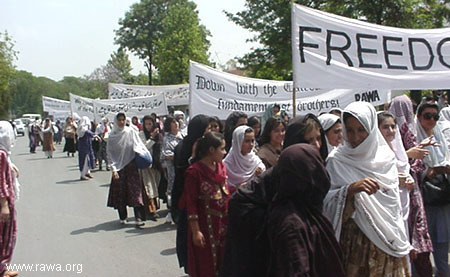 To condemn the Black Day of entrance of the criminal fundamentalists in Kabul in April 28,1992, the Revolutionary Association of the Women of Afghanistan (RAWA) took out protest rallies at Islamabad and Washington DC against Taliban and Jehadi forces and demanding a free and democratic Afghanistan. The demonstration at Islamabad was held at Nishtar Market, Peshawar Mor. 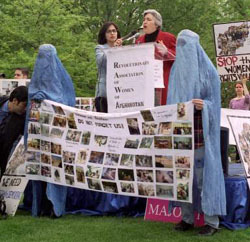 The demonstrators numbering more than 500 women and girls arrived from Peshawar and some other cities of Pakistan and nearby provinces of Afghanistan. 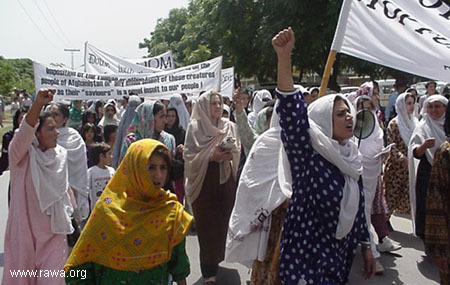 Some refugee Afghan women in Islamabad also jointed the demo. The demonstrators, marching in neat ranks, carried large photos depicting the destruction and devastation in Afghanistan and portraits of Martyred Meena, together with banners and placards in Pashtu, Persian, Urdu and English. A number of RAWA activists raised cue slogans which were responded to with fervor by participants in the march. Some of the slogans on the banners were: "Neither the Taliban nor the fundamentalists, Freedom and Democracy", "Freedom", "Democracy", "Collaboration with any of the fundamentalists is equivalent to treachery". The rally passed through Nishtar Market and proceeded towards Karachi Company. On the way the demonstrators chanted slogans against the Taliban and Jehadis and in favor of democracy, freedom and women's rights. Among the chanted slogans were: "April 28 is more odious than April 27", "Long live Freedom Democracy and Women's Rights", "Neither the Taliban nor the Fundamentalists, Power to the hands of Afghan People", "Down with the Taliban and Jehadis". One of RAWA activists delivered a speech in which she urged the international community to pressurize the countries not to provide the Taliban and Jehadis with military and financial support. A large number of journalists were present in the event. Among them were AP, Reuters, Al-Jazira and AFP, who made video coverage of the demonstration. The event gained a large coverage in the Pakistani media and almost all the leading English; Urdu and Pashto newspapers published reports and photographs of the demonstration. Persian and Pushto services of radio BBC and The Voice of America broadcasted the report of the demonstrations and interviews with some RAWA members in Pakistan and the USA. 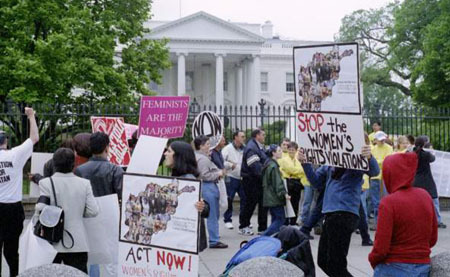 Also RAWA in an event sponsored by the Feminist Majority Foundation and National Committee of Women for a Democratic Iran (NCWDI), and attended by more than one hundred people, marked and condemned the 8th dark anniversary of the fundamentalists take over of Afghanistan. RAWA members, held a press conference at the scene and revealed the latest reports on the atrocities by the Taliban rulers against the people of Afghanistan, in particular Afghan women. RAWA also discussed the ways which international community and in particular American people and US government can assist Afghan people. NCWDI President, Ramesh Sepehrrad, in welcoming the crowd praised RAWA for its relentless effort on promoting and monitoring women’s rights in Afghanistan. Eleanor Smeal, President of the Feminist Majority Foundation spoke on how RAWA’s projects have been so effective in the daily lives of Afghan women inside and outside of Afghanistan despite the danger imposed by the terrorist fundamentalists.  RAWA members in their resolution criticized US government for its support to the Taliban and Jehadis. RAWA noted that the US must play its role to bring the Taliban and Jehadis leaders to the international court as the most brutal and inhuman war criminals against women. RAWA also advised US not to give asylum to any fundamentalist as well as Parchami and Khalqi traitors. RAWA urged the US to send relief aid to Afghan people in the southern and northern provinces however the assistance should be given to the people without the least involvement of the Taliban and Jehadis. RAWA asked US to initiate an effort in the United Nations to deploy peace-keeping forces to Afghanistan. The presence of UN forces and other NGO’s in Afghanistan will give hope to Afghan nation and will allow basis for security, access to health and education as well as other basic needs for people. Also to support our demonstration in Pakistan, a group of RAWA supporters also staged a demonstration in Rome and Milan, Italy on the same day.